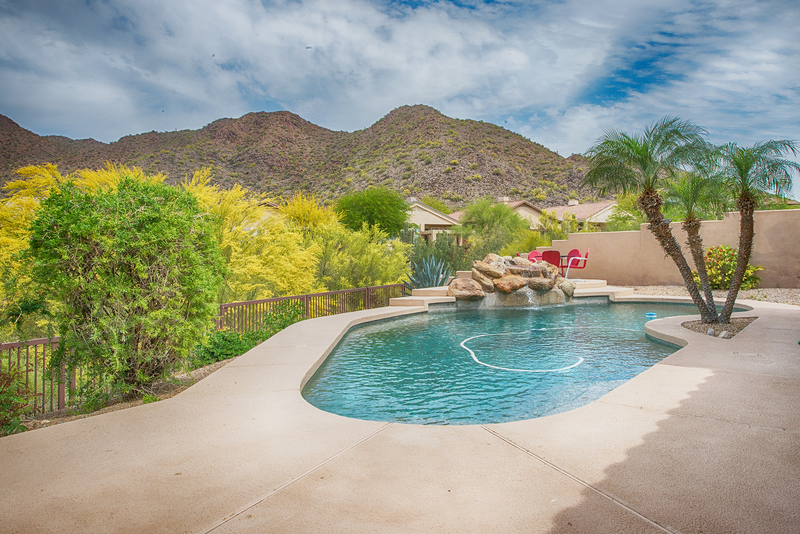 This single story home in the prestigious, gated Scottsdale Mountain community features gorgeous mountain views. Its superior floor plan has a den/office, a living/dining room, a family room with wood burning fireplace, and a spacious kitchen that boasts stainless steel appliances, granite countertops, oak cabinets, travertine tile, and an eat-in counter/breakfast bar. the master bedroom overlooks a private back yard with an inviting pool graced by a large waterfall and the soothing sound of running water. Designer touches incl. plant shelves, niches, travertine tile and multi-level ceilings. A large walk-in closet is off the master bath, which comes equipped with a vanity area, separate tub and shower and natural slate and travertine everywhere. Lots of windows and vaulted ceilings makes it light and bright!! No smokers or pets means clean! Easy to maintain desert landscaping. Covered patio overlooks desert common area and the tremendous views. Extremely quiet NS exposure lot is on a low traffic cul-de-sac. 3 car garage for all your toys or extra storage. Upscale community is near to highly rated schools, and features heated spa and tennis center and is close to parks, trails and hiking.